From the early 1950s through the mid-1980s, an incredible 30 plus year run, the children of Wichita, Kansas ran home from school to watch Santa Claus in his workshop on KAKE-TV and later KWCH-TV. The program ran seasonally from Thanksgiving Day until Christmas Eve and was done live for many years. 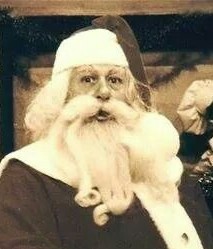 Santa was portrayed by local TV personality Henry Harvey. The show provided a daily count-down to Christmas, read letters from children and showed what toys the good boys and girls might expect in their stockings or under their Christmas Trees. Puppets interacted with Santa and the viewers at home. Henry, as Santa, would end every show with his jolly voice saying “Soon, my reindeer and I will be ZOOMING AROUND THE WORLD!” Henry also made many local appearances in and around the greater Wichita area making him a beloved and iconic Santa.